A Labour government would seek to ensure "we build things here that for too long have been built abroad", party leader Jeremy Corbyn has said. He told the EEF manufacturers organisation that new train carriages, defence, NHS and new passports were areas where money was spent abroad. Mr Corbyn also said he would end the "racket" of public sector outsourcing. He said that on Brexit the UK needed a new customs union with the EU to avoid ending "in hock to Donald Trump". Mr Corbyn, launching his Build it in Britain campaign in Birmingham, said: "For the last 40 years... we've been told that it's good - advanced even - for our country to manufacture less and less and rely instead on cheap labour abroad to produce imports, while we focus on the City of London and the finance sector. "A lack of support for manufacturing industry is sucking the dynamism out of our economy, pay from the pockets of our workers and any hope of secure, well-paid jobs from a generation of young people." He added: "Labour is determined to see public contracts provide public benefit, using our money to nurture and grow our industries, our people and to expand our tax base." 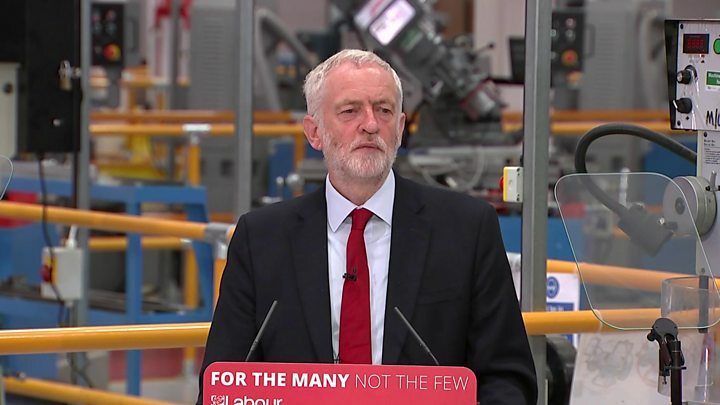 Mr Corbyn said Labour would intervene to bring quality jobs to all regions, saying that his party would opt out of parts of world trade rules if necessary to ensure jobs went to local people, rather than sit back "and manage decline". On Brexit, Mr Corbyn said the fall in the value of the pound as a result of Brexit had not provided the benefits to exporters it should have, because the Conservatives had "sold out" manufacturers. He said the prime minister "and her warring Cabinet should think again, even at this late stage, and reconsider the option of negotiating a brand new customs union". "This decision doesn't need to be a matter of ideology... it ought to be a matter of practical common sense." Otherwise a "botched" Brexit "will sell our manufacturers short with the fantasy of a free trading buccaneering future, which in reality would be a nightmare of our public services sold to multinational companies and our country in hock to Donald Trump, while we are all told to eat chlorinated chicken." For the Conservatives, Robert Jenrick, exchequer secretary to the Treasury, said: "This is laughable coming from the Labour Party who oversaw millions of jobs lost and a record decline in manufacturing. "We know from last time Labour don't know how to handle the economy and now their plan would mean higher prices for families and lower wages for workers. "Under the Conservatives, exports are up, there's more business investment, more manufacturing jobs and employment is at a record high - meaning more people have the security of a regular pay packet." The Lib Dems Brexit spokesman Tom Brake accused Mr Corbyn of living in a world of "alternative facts" by talking about the benefits of Brexit, adding he was "laying the path for the Tories' chaotic Brexit". Stephen Martin, director general of the Institute of Directors, called Mr Corbyn's plans "protectionism". He said: "For all the criticism of America's current approach to trade in this speech, the proposals of subsidies and 'buying British' are just as protectionist as tariffs. "Britain has many fantastic manufacturing firms, but the fetishisation of factories and production lines over all other parts of the economy is misguided. We should not be ashamed of our world-class creative, digital and professional services."